In 2009, Allie Stevens, 61, began to walk from Oceanside, California, to Miami, Florida, to set the Guinness World Record for the longest distance traveled by foot. 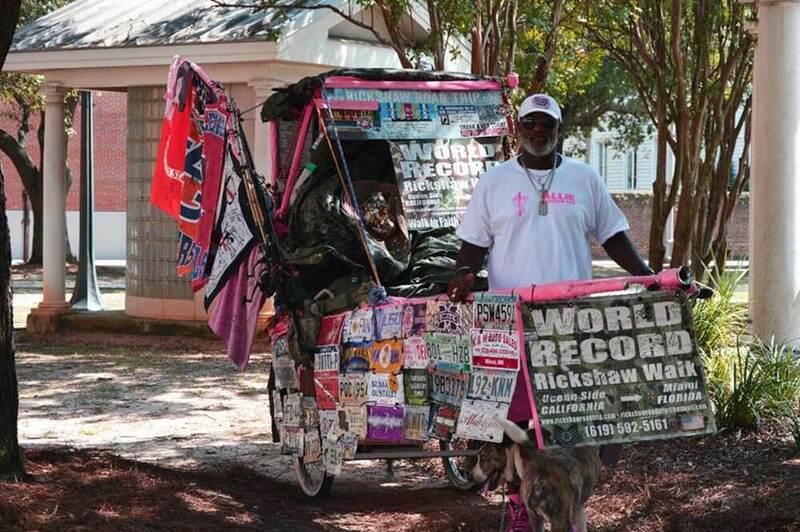 So far, he has walked close to 4,100 miles to Mobile with his 400-pound rickshaw and will stay here for several weeks before moving on to Prichard. Stevens, a California native, has not always lived his life on the road. Before he decided to set out on his first journey in 2007, he founded and ran his own successful limousine company. In 2007, Stevens’s wife died of pancreatic cancer. Soon afterwards, in 2011, he lost his daughter to cervical cancer. While fishing one day in Oceanside, Stevens decided to give people free rickshaw rides along the length of a 1,942-foot pier, partly to get in shape and partly to get his mind off the loss of his wife. “I named the first rickshaw the Shangri-La rickshaw, because Shangri-La means ‘imaginary heaven on Earth’ and since I give you free rides and I sing to you while you’re getting a ride, it takes you to heaven right there on the pier,” Stevens said. (Photo/ Holden Barnett) U.S. Marine Corp veteran Allie Stevens began walking across America with a rickshaw and a pet after he lost his wife and daughter to cancer. He’s currently in Mobile County, en route to Miami. During one of these outings, he remembered his lifelong dream to break a world record and wondered if he could reconcile the two ambitions. Stevens was able to walk 147 miles before he was hit in the back with a bottle and paralyzed for three days. On his second journey in 2008, Stevens was able to walk 642 miles before he was struck by a police car in Tombstone, Arizona. A year later, he began his third and current journey. Along the way, Stevens has experienced his fair share of difficulties. Traveling the state of Texas took him three years alone. One of his goals for the journey is to collect personal and family histories from the people he meets along the way. Another goal of Stevens’ is to visit as many churches as he can and share songs he has written. Although Stevens has written many songs, he does not copyright them. Like a Buddhist monk creating a sand mandala with the intent destroying it, he creates art so that others may share it. Although raised Catholic, Stevens now follows a nondenominational faith. While on the road, Stevens cannot be picky about his diet, especially when he is far from civilization. His favorite kind of insect to eat is grasshoppers. Although many people would never touch a grasshopper, let alone eat it, Stevens sometimes is not afforded the luxury. He has had to eat many other insects as well. 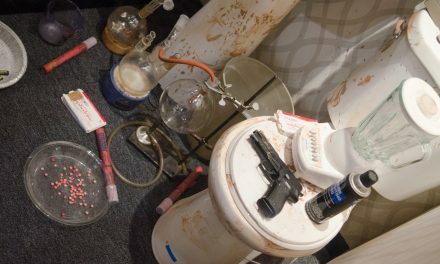 Although Stevens isn’t very choosy about where he stays, he is sometimes offered living space by people who are inspired by his journey. Other times, he sleeps in an army cot, a practice he said he perfected while serving in the U.S. Marine Corps. A modern supplicant, Stevens lives solely on the kindness and generosity of others. Although Stevens never asks for donations, gifts are appreciated when he receives them. Although the journey has been arduous, Stevens has not had to accomplish it alone. He has a dog named Roxy that has accompanied him along the way. When asked what the most difficult part of his journey has been, the answer was not what one would expect. The best part about the journey, Stevens said, is the love that he sees in everyone he meets. He feels Mobile, in particular, is graced with a beauty and simplicity found nowhere else in the country. Although Stevens has experienced a lot of hardship in his life, he’s still grateful for everything that has happened to him. After he reaches Miami and completes his journey, he’s going to write an autobiography and create a documentary about his experiences. Not for the money, he clarifies, but because he wants to share them with the world and, in doing so, glorify God.